Bad photo with phone, but didn’t want to get too close and frighten them off. come and see them tomorrow, they’re growing fast. To celebrate our 17th century Gardens’ new ‘Auricula Theatre’ feature we are holding a day with specialist growers HillView Hardy Plants. On Easter Bank Holiday Monday, the nursery people from HillView will answer questions, give advice about growing, and of course sell you some of their lovely range of plants, which will be at their height around this time. The Primula auricula is usually known as auricula, or by the folk names of mountain cowslip or bear’s ear. The upright stalks and colourful headed flowers were popular, and coveted, from the early 17th century. Rare beauties were so prized that they were sometimes presented to a seated and expectant audience, appearing from behind a curtain, with many ‘oohs and ahhs’. As a 17th/18th century Garden, there would undoubtedly have been auriculas grown here. Our, modest but authentic, Auricula Theatre will complement the season of mini-flower exhibits reflecting the picture in the Music Room. Come along on Easter Bank Holiday Monday to find out more. Part of our #GrowtheGardens fundraising this year. They say what goes around comes around, well its certainly true for two local charities. With 10 acres of ground and over 600 species of plants, it takes a lot of compost to keep our soil healthy and productive. So we are really pleased to be working in partnership with the Donkey Sanctuary in nearby Sutton Coldfield. Naturally, the donkeys produce a lot of poo… on a daily basis. With limited space on site the Sanctuary needs places where they can ‘recycle’ the recycled donkey food. As well as some very lucky allotment holders, Castle Bromwich Hall Gardens are thrilled to be able make good use of lots of donkey ‘soil improver’. Normally we add the fresh, straw laden donkey-doo to our compost heap to rot down into nutrient rich earth to use on the vegetable beds or in potting compost. At this time of year it can go directly onto some of our Wilderness beds to act as a ‘mulch’; keeping in the warmth, suppressing any weeds that feel like poking their heads above the ground and, eventually, improving the structure of the soil. Celebrate the return of the light with the ‘sweet harbinger of Spring’, the delicate snowdrop. Sunday 5th February 11am -3pm. Our snowdrops have been increasing every year and they make a delightful show of sprinkled white and green in the Lower Wilderness. The first Snowdrop day Sunday 5th February is a family day out dedicated to welcoming back the longer days and brighter light. For ‘gardeners’ there will be short guided walks and sales of plants, our Green Man will delight us with stories and song about spring and winter. Join us in making simple lanterns to light our way round and fashion a traditional Brigid Cross to hang on your door. Hot drinks and homemade soup will be available in the shop. Come back to see the later flowering snowdrops on a second snowdrop Sunday (19th February). We’ll be posting the date for our own pruning of fruit espaliers courses shortly, but it’s pruning on a much bigger scale that our gardeners will need to be tackling this coming year. Last year, both of our two heirloom orchards got a much needed trim and we’re hoping to see much bigger yields as a result. We did lose one or two trees this year, but there are others nearly ready to replace them. There’s a bit of a battle looming. The Holly perimeter hedge has not had much attention over the last five years and has grown to 3 times the intended height and breadth. It is now seriously overshadowing the Apple and Pear trees in the ‘New Orchard’. We’ll need to radically trim back this year if we are to expect our magnificent blossoms to shine again. If you are able to help us (there is nearly half a kilometre of hedge so, we’re tackling it bit by bit).. … keep checking back here for callouts. We have over 130 mature trees in the Gardens. Most of which are important enough to have Tree Preservation Orders on them. Caring for them and keeping them in good shape – literally – is a responsibility we are proud to be able to undertake. Although it’s financially expensive and time consuming for a small Charity like ours, without the trees framing our views, shielding us from the winds, sheltering our beneficial bugs and birds and yielding us fruit, we would be much poorer in spirit. This year we’ve been drawn to the custom of Tree Dressing as a way to express our positive relationship with trees …. a little ‘thank you’. Celebrated in the first weekend of December the custom was revived in 1990 by the group who re-invented Apple Day; Common Ground. “Trees have long been celebrated for their spiritual significance. The simplicity of tying strips of cloth or yarn to a tree is universal and timeless. The old Celtic custom of tying cloth dipped in water from a holy well to a ‘clootie tree’ echoes the practice in Japan of decorating trees with strips of white paper, or tanzaku, bearing wishes and poems. The twenty-first century trend of ‘yarn bombing’ in Europe and North America transforms the local landscape with bright fabrics and yarns, like the Buddhist tradition of tying ribbons around the trunk or the annual Hindu festival of Raksha Bandhan when coloured strings are tied onto trees and plants to call upon the power of nature to protect loved ones. Some of us went down to visit one of our lovely walnut trees that supplied us with shade during the summer family activities and supported our community art work ‘the knit knot tree’. With paper lanterns, twig dreamcatchers and wool apples we decorated the tree. A ring of colour on the bare branches. Why not come and visit it add your own decoration perhaps. So when you are decorating your Christmas tree this year, think about adding one of your decorations to a living tree on your street. 1760 was a long time ago, especially in flower terms. Plant and garden enthusiasts develop hundreds, if not thousands, of new plant varieties every year. Here at Castle Bromwich Hall Gardens we try to grow plants that would have been familiar to the gardeners up till the mid 18th century. Sometimes, especially with simpler plants and herbs, there has been little change; looking at old drawings and engravings you can easily identify some plants we grow today. Others have been refined and developed far from their origins. Flowerheads are often bred for brighter colours and greater showiness. Here we try to get a balance between pleasing our 21st century eyes and maintaining a period 17th and 18th century feel. For our spring displays we have a mix of modern and older daffodils and tulips. This year we are particularly pleased to introduce two stunning early flowers both as it happens, supplied to us by Thomas Etty Esq. of Somerset. The narcissus poeticus albus plenus odoratus was probably around before 1590 and sometimes is called the double Pheasants Eye or Gardenia-flowered narcissus. It’s all white (albus) with a full and ‘plentiful’ centre (plenus) and very fragrant (odoratus). We hope you will find it peeping over some of our box hedges on the North Border. On a sunny day you may even smell it before you see it. behind the Holly Walk, alongside the cowslips, primroses and daffodils. Magical! It’s that time of year again. Can you help us out? Tulips were a ‘really big thing’ for our Gardens’ founders. In the 17th century there was even ‘tulipmania’; massive fortunes were won and lost by enthusiasts and tulip traders. These days we’re a bit more level headed, but we are mad about the beauty of our spring borders. Many of our lovely ‘daffs’ come back year after year and naturalise in the orchard and grassy banks. But like tulips, they need renewing every now and then. This year we have over 2,000 tulips, daffodils and narcissi to plant before the cold frost comes. You don’t need to be an expert, just come and join us on Tuesday, Wednesday or Thursday mornings next week and be part of the planting team. We’ll show you how. We’ll be planting from 10am – 12.30 . on 29th, 30th November & 1st December. Weather permitting. Warming tea and coffee supplied. Turn up at 10, or contact us in advance. Plant the little globes full of flower goodness… stand back and wait for a spectacular spring! It’s been an exceptionally good year for our pumpkin and squash crop. Some went to enliven Halloween, some have been sold to our visitors. Traditionally – with the help of volunteers – we then turn them into delicious soup to sell to our customers in the colder months. This year we’re going a little further. Our volunteers have had a group chopping and cooking session. 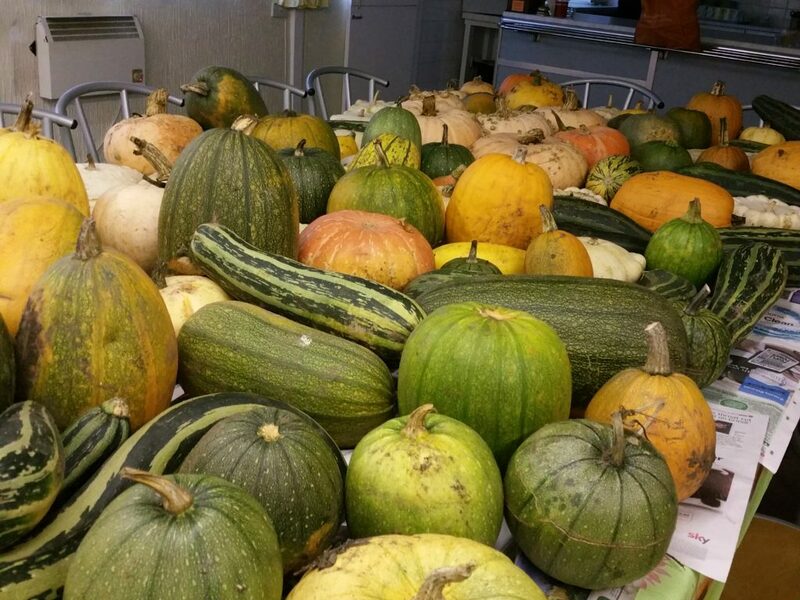 The surplus soup and spare squashes will now be shared with some other charities. We love growing these triffid-like plants in our South Kitchen Garden and chuffed that all the effort will not go to waste but will go to provide some warmth and sustenance to others who need a little extra.